5-sided programming. Do you need a CAM system? For 5-sided machining, there are controls that allow machinists to program a 5-sided part without the need to buy a CAM system. This is an important consideration when a shop is thinking about purchasing a 5-axis machining center to do 5-sided machining. Hurco is one of a handful of controls that lets you program a part for 5-sided machining without a CAM system. As the inventors of conversational, Hurco continually leads the industry in creating a user-friendly programming method that is intuitive and decreases setup time. Read about the history of conversational programming. While you research other 5-axis machines, the following description of control software features will provide a baseline approach so you can compare capabilities from one control to the next. No CAM system needed if you purchase a machine with the right control. Program the part at the control. How it works: the machine coordinates are uncoupled from the part coordinates, which means you only need to find the top corner of the part and the machine knows where the machine position is located in relation to the centerlines of rotation. 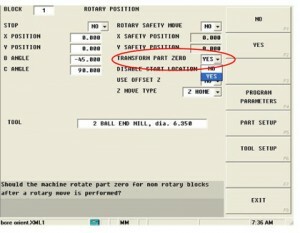 Transform Plane controls the other locations for each of the rotary moves after you locate part zero. The control software only needs you to define part zero one time, and it manages all of the other part zero locations. It basically changes programming on a 5-axis machining center back to 2.5D programming that you would do on a 3-axis machine. You don’t need to worry about the tilting or rotating. How it works: The tool axis becomes the z-axis. The control calculates all the tilting and rotating required. In the TRANSFORM PART ZERO field, select YES. From the TRANSFORM PLANE REFERENCE POINTS screen, simply enter the values from the original part zero. The control software knows all of the information it needs to calculate all of the other part zero setups. How it works It adds UVW, which is the surface contact point of where the radius comes in contact with the surface it is cutting. 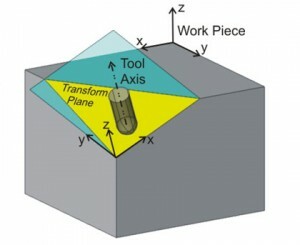 The machinist only needs to change the D (diameter) and R (radius) values of the tool. The 3D Tool Compensation feature does the rest. Shortest Angular Traverse takes the fastest path to reach the target position. Make sure the machine’s control has the ability to turn this feature on and off. The rotary axis on any machine is generally the slowest. Using M126, the machine is commanded to take the shortest path. For example, if you position the rotary axis at 350 degrees and then command the next position to 20 degrees, the distance will be 30 degrees versus 330 degrees if the machine didn’t have Shortest Angular Traverse activated.